In the last few years I've been experimenting with ways to bring in a handmade element to my graphic design work. I've been a freelance graphic designer for almost four years and constantly pushing myself to grow and stay fresh. I entered an MFA program in graphic design and illustration just over a year and a half ago and really gave myself room to grow and experiment. Before entering the program I took several improvisational woodblock printing courses with Somerville, MA artist Annie Silverman (who will be offering several classes this spring, by the way). 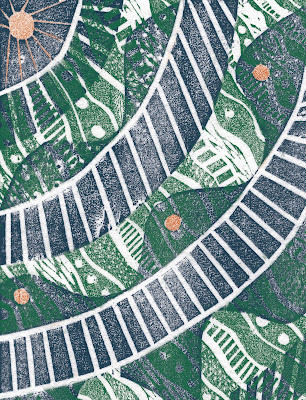 In discussions with Annie I immediately began to find direct similarities between her style of printmaking and working with layered images in Photoshop. I thought about experimenting for sometime before actually getting the opportunity in my MFA program. My first experiments were to scan prints I created and use them within text. I also experimented with hand rubbing ink from a cloth over stencils on paper and then scanning that in. 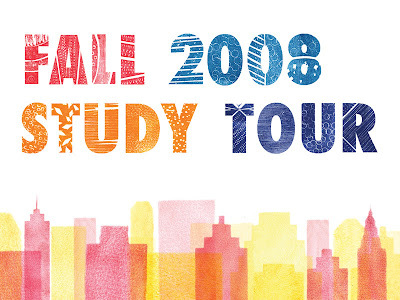 Resulting in the below cover from a book from my fall 2008 semester. Many other experiments were to follow until I finally discovered that making a set of Photoshop brushes of my prints was the best method. I played around with blending layers and opacity, as well as layering many different textures and masking. The result was a series of what I'm calling "digital prints" that I used on another cover for a book in my MFA program in fall 2009. Last week I decided to experiment with the new logo I recently developed for Pressbound and reworked it as a digital print. Though I think that there is still plenty of room to experiment with this technique, I am certainly pleased with the direction that this is taking. I never thought I would say this but making digital images that look like prints is almost as fun as making them on an actual press. But for very different reasons. The digital aspect of this opens the doors to new experimentation I would most likely not have time to achieve nearly as quickly in the analog world. I am not afraid to try anything because I know I can easily command-Z my mistakes or save files in different levels of completion or delete layers to easily rework a print. I don't have to worry about matching ink colors or printing a color that doesn't match the others in a print. Plus I am not wasting paper or spending money on renting press-time or buying inks and paper. The experiments I am doing on screen also help me understand ways that I can create on a press. Though my time is limited and my usual method of printing is letterpress, I can't wait to eventually get back onto the relief press and see what new work I can create by hand. Nothing can replace the smell and feel, and most importantly, the satisfaction of creating an actual print.